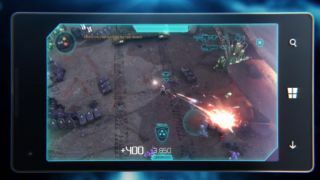 The Halo experience is about to go rogue for the first time, with brand new title Halo: Spartan Assault heading exclusively to Windows 8 and Windows Phone 8 devices. With speculation kicking off this week that Spartan Assault would be the name of the next Console-based Halo (following the discovery of some registered domain names), the new title will actually be gunning for gamers on the go. The top-down shooter will be available on Windows 8 phones and tablets, as well as PC, with cloud saves meaning you can stop playing on one device and pick up where you left off on another. There are also a number of ways to play control-wise, including standard touchscreen, plugging in a mouse and keyboard, or even connecting an Xbox 360 controller. 343 industries said that the game will be priced in the US at around $6.99 (about £4.60, AUS $7.25) while a specific figure for the UK is yet to be confirmed. Dan Ayoub, executive producer of publishing at 343, told TechRadar that there was already "a lot of plans for content already for post-launch," adding that the game will include a challenge mode, with users able to share their scores on the leaderboard. This game will be released this July across all countries and devices, though a specific day for the global rollout is yet to be given. Ayoub also told us that Halo: Spartan Assault has been in development for about a year. However, we then remembered a certain job posting by Bungie back in early 2011, suggesting that this project might have been in the pipeline even longer. The game is set between the events of Halo 3 and Halo 4, mixing many of the action and sandbox elements that fans of the the franchise will be more than familiar with. "Halo has always led on its platform," said Ayoub. "And so we wanted to do the same thing on PC, tablet and mobile." The game uses an adaptive twin-stick touchscreen control system, meaning that when your thumbs glide up the screen, the circle pads move with them. "It's no exaggeration when I say we threw out at least twelve control schemes getting to this," admitted Ayoub.